Once you've captured them, you must make it to Fools' Landing and escape by helicopter to win. If however, the island sinks before you can complete your tasks, the mission ends in defeat. Shuffle the 24 Island tiles and randomly place them face up (non blue and white side) into a grid as follows: First make a 4 x 4 square of tiles in the center of the playing area. Then place 2 tiles next to each of the 2 middle tiles on every side of the square. (Important Note: Leave a small gap between the tiles). 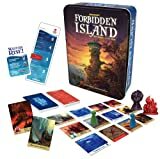 This forms Forbidden Island and your pawns will move on it like a game board. Separate the cards into three decks according to card back: Flood deck (blue back), Treasure deck (red back), and Adventurer cards (6 cards). Shuffle the Flood deck and place it face down on one side of the island to form the Flood draw pile. Draw the top 6 cards (1 at a time) and place them face up next to the draw pile to form the Flood discard pile. For each card drawn, flip the corresponding Island tile over to its "flooded" (blue and white) side. Shuffle the 6 Adventurer cards and randomly deal 1 to each player. Each of you will take on the role of an adventurer with a special power that only you can do during the game. Take a moment to read aloud your roles and powers written on the bottom of the cards so that your teammates know your strengths. You'll find the game will be easier to win if you cooperate and take advantage of these special powers. Take a pawn matching the color of your Adventurer card and place it on the corresponding Island tile. 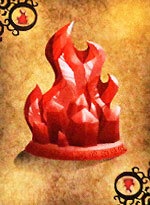 (Look for the matching pawn icon in the lower right corner of the Gates and Fools' Landing tiles). Put any extra Adventurer cards and pawns back in the box. Note: It's OK to start on a flooded tile. Thoroughly shuffle the Treasure deck and deal 2 cards to each player. Place your cards face up in front of you so that both you and your teammates can easily see them. If anyone gets a Waters Rise! card, give them a replacement card and shuffle the Waters Rise! card back into the Treasure deck. Place the Treasure deck face down by one side of the island. Note: There will be a Treasure discard pile right next to the Treasure deck. Place the Water Level marker on the left side of the Water Meter and set it to the appropriate starting difficulty level, according to the type of game you want to play. (For example, if this is your first time playing a cooperative game, set it to the Novice level). Take up to 3 actions. Draw 2 Treasure deck cards. The parts of each turn are described below. Also note that the back of every Adventurer card shows a quick reference guide. You may, for 1 or more actions, move your pawn to an adjacent Island tile: either up, down, left, or right, but never diagonally. You may move onto a flooded tile, but may not move onto (or over) the space of a missing tile. The Explorer may also move diagonally. You may, for 1 or more actions, shore up any adjacent Island tile (up, down, left, right), or the Island tile your pawn is on. To shore up a tile, simply flip it over so its un-flooded side is facing up. The Explorer may also shore up tiles diagonally. You may give 1 or more of your Treasure cards to another player if both of your pawns are on the same island tile. It costs 1 action for each card you give away. You may not give Special Action cards. The Messenger may give cards without having to be on the same tile. When you capture a treasure, discard cards to the Treasure discard pile and move the figurine in front of you. You may capture a treasure on a flooded tile. After taking actions, you must draw 2 cards from the top of the Treasure deck and add them to your face up hand. Draw cards 1 at a time. If you draw a Waters Rise! card, do not add it to your hand, but follow the instructions on the card and then discard it to the Treasure discard pile. There are 5 of each Treasure card in the Treasure deck. 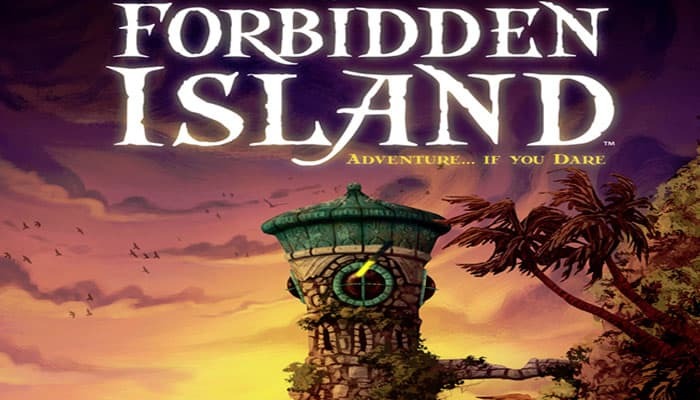 The aim is to collect 4 of the same Treasure card in order to find the corresponding treasure of Forbidden Island. You can give Treasure cards to other players using the Give a Treasure Card action. They will help your team during the game. These cards are taken into your hand and can be played at any time - even on another player's turn. Playing a Special Action card does not require an action. Discard these cards to the Treasure discard pile immediately when played. Note: You may use the power of a Special Action card if you are forced to discard it. Move the Water Level marker up to cover the next tick mark on the Water Meter. Note how many cards will now be drawn at the end of your turn by looking at the number on the right of the meter. Take all of the cards from the Flood discard pile, shuffle them, and then place them face down on top of the Flood draw pile. This means that previously drawn cards will be drawn again soon! 3. Discard the Waters Rise! card to the Treasure discard pile. If you draw a Waters Rise! card, you do not get a replacement card. If you draw 2 Waters Rise! cards in a row, shuffle the Flood discard pile only once but move the Water Level marker up 2 tick marks. If you draw a Waters Rise! card but there are no cards in the Flood discard pile, just move the Water Level marker up 1 tick mark. When the last card of the Treasure deck is drawn, immediately shuffle the Treasure discard pile and turn it over to form a new Treasure deck. You may only have 5 cards in your hand, including Treasure and Special Action cards. If you ever find that you have 6 or more cards (for example because you drew more cards or received cards from another player) you must immediately choose and discard the excess to the Treasure discard pile. If you choose to discard a Special Action card, you may use its action before discarding. 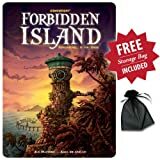 After drawing 2 Treasure cards, you must now take on the role of Forbidden Island! Draw a number of cards from the top of the Flood draw pile equal to the current Water Meter level. (For example, if the level is at 3, draw 3 cards). If the matching Island tile is un-flooded, flip it over to its flooded side. If the matching Island tile is already flooded, it sinks into the abyss! Remove it and the matching Flood card from the game and place them out of play. Note: You cannot play a Sandbag card to save a flooded tile once you've revealed the matching Flood card. If a pawn is on a tile that becomes flooded, lift the pawn off the tile, flip it and then return the pawn to the tile. If a pawn is on a tile that must be removed, it must immediately "swim" to an adjacent tile (up, down, left, or right) that is still part of the island (even flooded). If a pawn is on a tile that is removed and cannot move to an adjacent tile, it sinks into the abyss and everyone loses the game! Exceptions: The Diver may swim to the nearest tile. The Explorer may swim diagonally. The Pilot may fly to any tile. If the Flood draw pile ever runs out, immediately shuffle the Flood discard pile and stack the cards face down to form a new Flood draw pile. If this happens in the middle of a turn, continue drawing Flood cards as necessary from the new pile. Get to Fools' Landing! 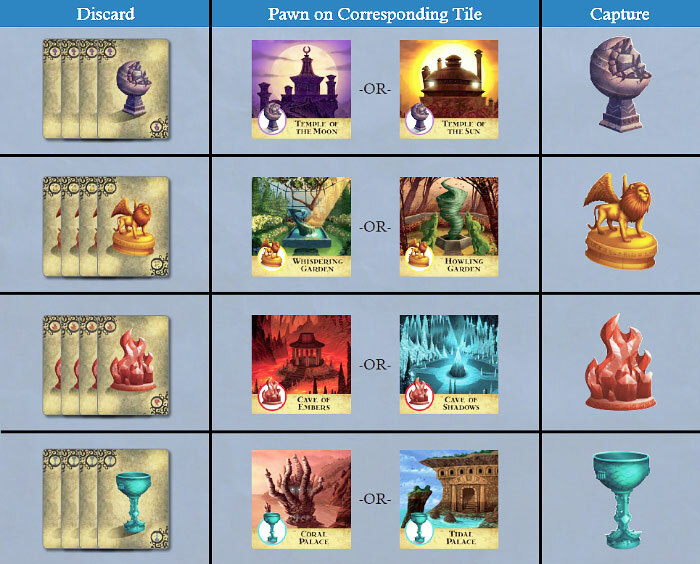 Once you have collected all four treasures, everyone must move their pawns to the Fools' Landing tile. Then, one player must discard a Helicopter Lift card to lift your team off of Forbidden Island for the win! Note: You may win if Fools' Landing is flooded. If both Temples, Caves, Palaces, or Gardens tiles sink before you collect their respective treasures. If the Fools' Landing tile sinks. If any player is on an Island tile that sinks and there is no adjacent tile to swim to. If the water level reaches the skull and crossbones.